The Munster Aberdeen-Angus Club held its annual sale of pedigree Aberdeen-Angus bulls at Bandon Mart, Bandon, Co Cork yesterday. The Munster Aberdeen-Angus Club is the only club in the Republic of Ireland to stage a major Spring sale each year and club chair and vice-chair, Billy Fitzgerald and Shane Healy and their hard working team of club members deserve huge recognition and appreciation for their efforts in making this year’s event such a well run and successful outing. 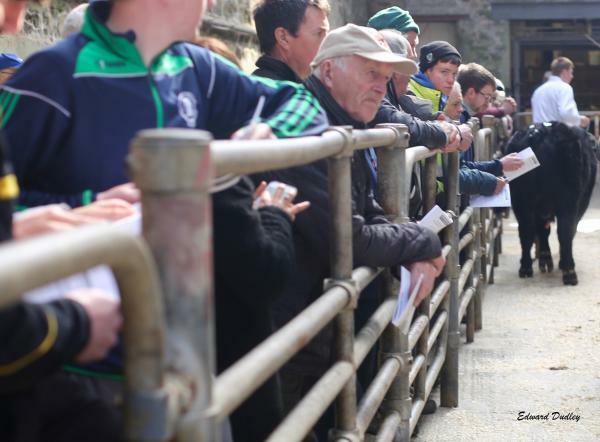 The sale, which is run in conjunction with Cork Marts, has been developed into one of the leading sales of its kind in the province over the last couple of years with older, Autumn 2017 born bulls selling most freely on this occasion. 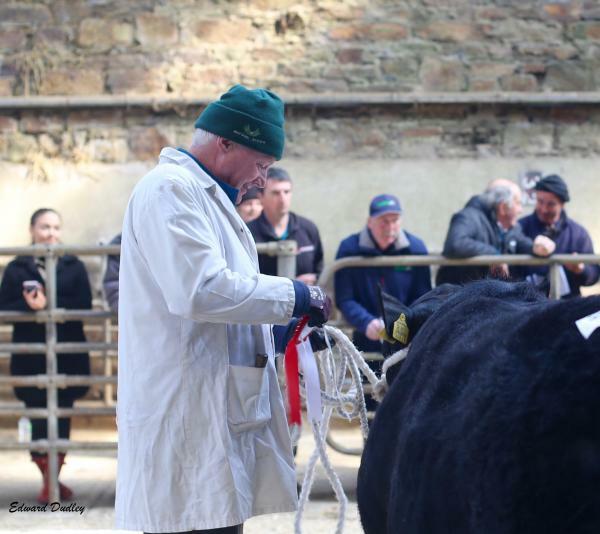 For the second consecutive year, the Inchisine Aberdeen-Angus herd of Denis O’ Riordan, Inchisine, Toames, Macroom, Co. Cork provided the overall sale topper in the Aberdeen-Angus section with the 18 month old, Inchisine Padraic selling for €3260. This one is a grandson of Cheeklaw Eirwyn D165 and is out of a homebred cow that goes back to Knockadrinan Bell Man F366 and carried a 5 star replacement index as well as a calving ease figure of 1.8%. This bull won his class in the pre-sale show and went on to be tapped out as the reserve supreme Aberdeen-Angus champion later in the day. The Inchisine Aberdeen-Angus herd also sold three more bulls, Inchisine Pat, Inchisine Patrick and Inchisine Perex for €2600 each to average €2765 for their pen of four bulls and cap another terrific day’s trading at Bandon for the O’ Riordan family. John & Kate Tait, Westwood, Rostellan, Midleton, Co. Cork secured the supreme Aberdeen-Angus championship with Westellen Dyson T831 under first time judge, Barry Smith of the Lawsons Ford Aberdeen-Angus who made the long trip down to Bandon from Cootehill, Co Cavan to officiate in the show ring. The champion bull was born in November 2017 and is sired by Bova Lord Bonanza N266 and is out of Liss Dana E680 who is also dam of the successful AI bull, Westellen Diego M734. This one sold for €2950. Former Munster Aberdeen-Angus Club chairperson, Ciaran Kelleher, Kealkil, Bantry, Co Cork sold the September 2017 born, Kealkil Parkboy for €2800. This five star terminal index bull is sired by Cartronroe Ernie and boasted a calving ease figure of 1.4%. Meanwhile, herd-mate Kealkil Lord Enfield T495 sold for €2500. This one is sired by Liss Brendan M465 and was also born in September 2017. The younger, Spring 2018 born Aberdeen-Angus bulls failed to find much favour with potential customers, however the representatives of the late Robert Putz, Durrus, Bantry, Co Cork sold their 14 month old, January 2018 born bull, Cashelane Salvador U875 for €2560. This double 5 star replacement and terminal index bull was a 3rd prize winner in the pre-sale show and carried a calving ease figure of just 1%. 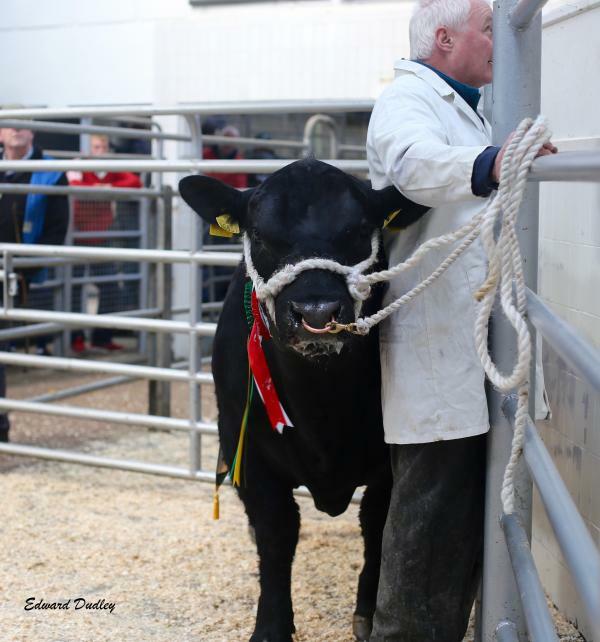 Overall, the sale enjoyed an average price of just under €2600 at a healthy clearance rate of 60% and the Munster Aberdeen-Angus Club would like to thank everyone who made the sale such a success and wish all of the day’s customers the very best of luck with their new stock bulls. 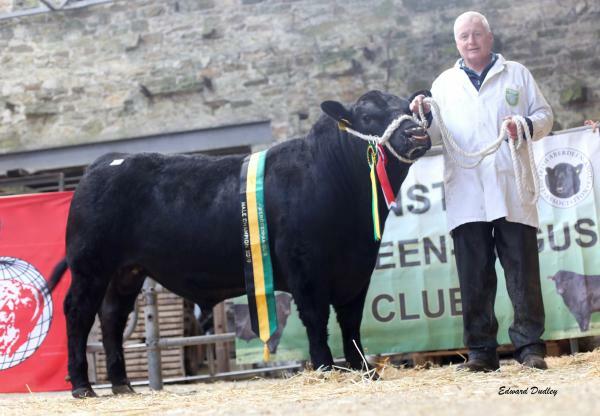 Supreme Aberdeen-Angus champion, Westellen Dyson T831. 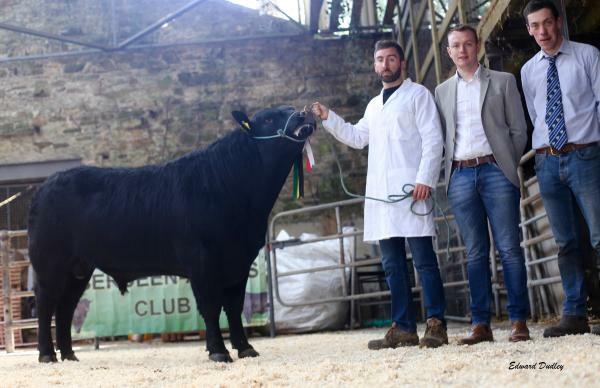 Reserve Aberdeen-Angus champion & top priced bull, Inchisine Padraic exhibited by Denis O' Riordan. Also pictured are Barry Smith (judge) and Billy Fitzgerald (chairperson, Munster Aberdeen-Angus Club).